Excerpt from Supplementary Code of Fair Competition for the Air Filter Industry (a Division of the Machinery and Allied Products Industry): As Approved on July 21, 1934 Average hours per. Week were reported to be in June, 1929; in June, 1933; and in October, 1933. In October, 1933, the average hours were per cent less than the June, 1929 average, and per cent greater than the June, 1933 average. The effect of the 40-hour provision with production at more normal levels may be estimated on a basis of total man-hours per week in 1931 divided by the number of hours prescribed in the Code. After. 1929, man-hours declined steadily from to a minimum of in 1933 (first six months), or approximately 70 per cent. 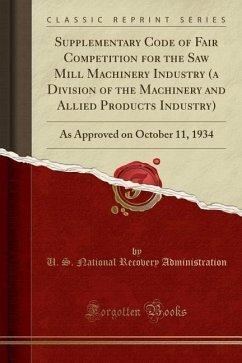 If it is assumed that the man-hours for 1931 are representa tive of the volume of production for that year, and a reasonable measure of man-hour requirements in a more normal period, the adoption of the 40-hour week would require a force of approximately employees, or per cent of the 1929 working level. About the Publisher Forgotten Books publishes hundreds of thousands of rare and classic books. Find more at www.forgottenbooks.com This book is a reproduction of an important historical work. Forgotten Books uses state-of-the-art technology to digitally reconstruct the work, preserving the original format whilst repairing imperfections present in the aged copy. In rare cases, an imperfection in the original, such as a blemish or missing page, may be replicated in our edition. We do, however, repair the vast majority of imperfections successfully; any imperfections that remain are intentionally left to preserve the state of such historical works.